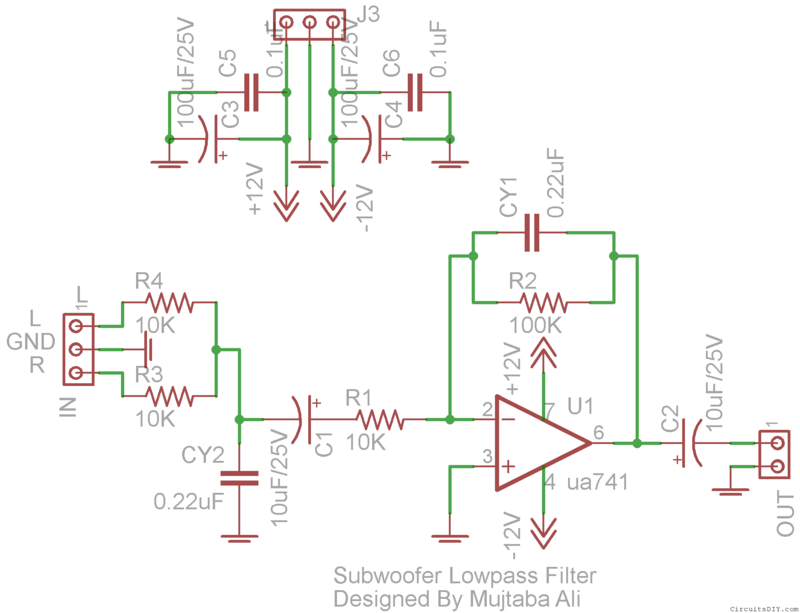 This is the simplest DIY low pass filter for subwoofer using uA741 single op-amp ic. The circuit performs really well compared to it’s price. The cut off frequency of this circuit is 25Hz to 80Hz maximum. Using this circuit , you can easily design a 2.1 Subwoofer and Speaker System at your home. The circuit is commerially available in market, contains very few components. You can easily make one by following the instructions in this tutorial. The same circuit is working in my own hand made sub-woofer system. So Try this. Below the part list of the diy low pass filter for subwoofer. I have seperately subwoofer circuit it require input. i want this circuit board is connect my 2.1 amplifier using la4440 ic .i dont know how to connect woofer circuit in amp.which point is input to woofer circuit in amp. Bit confused.. Can you suggest me.. Where to connect the smaller one?? Hi Sagar, where you want to connect which part ? Please clarify your question a little. I want to know where to connect the smaller circuit (Not having 741 IC)? And Is the smaller circuit need to be connect to power supply separately?? Are the Audio inputs connected to three pin connector? The smaller section is the power supply, you don’t need to connect the power supply separately. And you can make the circuit even on a beadboard. Hi good brother, I think you should first learn how to read schematics because you will face lots of difficulties when you are building your electronics projects. Thank you.